And here we have it ladies and gentlemen, the last chapters of Sengoku Youko. It's been a long ride from me reading Milky Translations' scanlations of Sengoku Youko before I even knew Japanese, to mean learning Japanese, to picking up the series myself (with help from Relm, Naselare, and Ustnap of course), and then to finishing it all in one big blast with help from Woods Runner, S.T.A.L.K.E.R., and all the other raw providers & redrawers that helped get these last 25 chapters out much faster that I ever would've been able to do myself. It's been a fun time working on this series, and we hope you all enjoy its conclusion. It's been a while ride! Thanks guys! Milky Translations... oh boy, this is too nostalgic. Huge thanks to all who worked on this series! Thank you so much for scanning and translating and cleaning up and redrawing and all other workers who put their time and effort in doing this series. thank you thank you thank you!! Thank you for spending so much time to scanlate this masterpice. The ride has come to an end, arigatou verxed scans! Thanks for the last chapters! Thank you very much for a job well done. Thank you, and thank Milky Translation for the awesome job you've given us for all these years. Thanks for the ride. I wish you well. 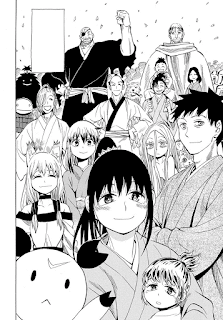 Knowing that Mizukami-sensei reuses world settings from time to time (like the fairy eye, and most likely the guy from "the dragon, the girl and the monster town" oneshot series is most likely Shinsuke's descendant), do you believe that this is the last time we hear of Senya? He's going to live at least until 2600 in that world after all, it seems.